Genuine folk music as part of an old and lively national culture is still flourishing in Norway, a country with a wild nature, numerous valleys, snow-covered mountains, lakes, deep forests, glorious fjords, remote communities, dark and long winters and shining summer nights. Norway has a long and rich tradition of musical expression. Norwegian folk music has survived through many generations and historical changes. Old folk tunes have kept surprisingly well, better than in the neighbouring lands and in some of the other industrial countries. 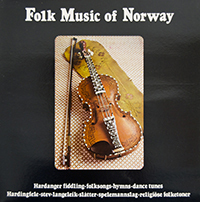 The selection on this record represents some of the main types and styles of living folk-playing and singing, with their special sound and moods, from south west and central parts of Norway. The players and singers are some of the most outstanding folk musicians of the younger generation who carry on the folk traditions of their districts.